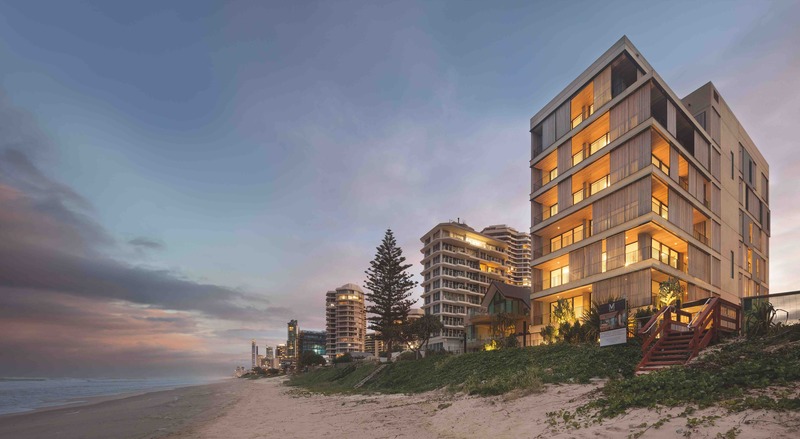 The scale and context of the built environment along Queensland's Gold Coast isn't to everyone's liking, but a new residential apartment building is challenging the notion that multi-rise has no place on the beachfront. M3565 Main Beach Apartments is an award-winning, luxury development comprising seven apartments spread over eight levels (the penthouse taking up two). Sydney-based architect, Virginia Kerridge, has designed an elegant, modern structure with carefully articulated facades that respond sympathetically to both the streetscape and the beachfront. One of the keys to the success of the design is the palette of materials and colours used. At its heart the building is concrete, with the material used as the principal structural element for the floor decks and framing. The rawness of the material is expressed beautifully on the exterior facades, where form lines and bolt holes are accentuated in the Class 2, off-form finish. Juxtaposed with the concrete are vertical panels of zinc alongside timber slatted screens (fashioned from recycled ironbark from old railway bridges) and black metal balustrading. It's not hard to see the thought process behind the choice of materials and colours. The pre-weathered timber slats evoke images of driftwood; the hint of 'sand' colouring in the concrete mix creates a visual connection to the beachfront; and the zinc panels have likewise been pre-weathered to give the immediate impression that the building is right at home within its environment. Over time, and as it continues to respond to the natural elements, this building will grow even more comfortable in its surrounds. The thoughtful placement of the materials also contributes to this sense of belonging, reducing the overall scale and giving it a 'lightness'. Each of the single-level apartments has four bedrooms. The ground-floor apartment has its own garden terrace overlooking the beach. On each of the above apartment levels, living areas are set back from the building perimeter along the northern and eastern sides to create deep, internal 'courtyard' recesses that encourage natural ventilation and create a sense of openness. The timber slat screens are independently moveable to provide shading in summer and invite warming sunlight in winter (while also providing privacy). These features contribute to a building with a relatively small environmental footprint; in fact, it was designed and documented (although not formally certified) to satisfy the Green Building Council of Australia's six-star Green Star rating. In many ways, Main Beach Apartments sets a new benchmark for multi-level residential development along Queensland's 'glitter strip'. And in so doing, it highlights yet again the core qualities of concrete - its durability, its solidity, its rawness and, above all, its ability to adapt to the challenges of just about any site and environment.